Israel - Jerusalem’s new secular mayor Nir Barkat has brought an ultra-Orthodox faction into his coalition, two weeks after forging one without any Haredi members and one week after taking office. 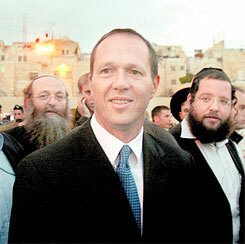 Barkat’s mayoral campaign was galvanized in part by the fight against what many secular Jerusalemites branded the creeping ‘haredization,’ or ultra-Orthodox takeover, of the capital. Today, he expressed satisfaction with the addition of United Torah Judaism party members to his coalition. “This is another stage en route to a broad, all-encompassing coalition that will enable [us] to embark on a struggle for the future of Jerusalem in a united manner,” said Barkat. Two weeks ago, Barkat put together a coalition without the ultra-Orthodox factions. The coalition consisted of Meretz, the National Religious Party, Yerushalayim Beiteinu and Hitorerut Yerushalayim. I'm sure Ger is well represented in this coalition. I should hope so, they got him the job. Ger is in Israel, what Satmar used to be in Williamsburg. Its smart for him to bring them into the coalition; as the old man said in the Godfather..."keep your friends close and your enemies clsoer". It will be harder for the hareidim to sabatoge Barkat efforts to restore some sanity into the Municipal policies with the frummies in the government...we should respect the hareidim in Yerushalayim but they will have to accepte the fact that this is a secular city and not their exclusive province. We are not Iran and will not have self-proclaimed religious police thelling other citizens what they can wear, where they can sit on the bus or drive on Shabbos. It will NEVER happen no matter how hard they try. There is nothing wrong with saying that Yerushalayim, Ir Hakodesh, is also a secular city whose inhabitants are subject to secular (aka "civil") laws enacted by through a democratic process. The hareidim can participate in that process if they choose to do so and if they win, they can legislate rules up to a point that conform to their beliefs and impose those rules on others. But, if they lose, and they did lose to Barkat, then they will have to accept a more "secular" set of rules. Alternatively, they could move to Tel Aviv. Yerushalayim is Ir Hakodesh and you and I might wish to defer to the sensibilities of the hareidim in certain areas of the city BUT our behavior is entirely voluntary because we are menschen and that doesn't change the fundamental fact that ALL of eretz yisroel is subject to the rule of civil law--not the views of one posek or rebbe from one group or another. If a woman wants to ride in front of the bus, wear a short sleeve dress that some super frummie might fear will incite him into uncontrollable behavior etc. , those are her rights in a democracy, whether in Yerushalayim or Tel Aviv and cannot be denied. We can accomodate within some reason but the hareidim have taken it too far and now they are at risk of losing it all. yerushalayim is full of tumah. It is less pure than boro park or williamsburg because it has movies,tattooo shops,violation of stores on shabbos which you dont find in brooklyn chassidisha areas.It also has a gay parade so how can u call it holy.